We recommend choosing your Roof Covering Material first, if possible, or at least decide on one or two types of roof covering materials that you might be interested in before obtaining proposals from Roofing Contractors. One way to familiarize yourself with the types of roofing materials available is to use the internet browsers and type in "roofing materials" or "types of roofing materials". You could then visit various roofing manufacturer websites or go to a roofing supply company showroom for a better look and feel. Ask for addresses where you can see the roof covering material installed that you are interested in before making a decision. Many times an installed roof covering material looks quite different from a photo or a single piece or sample board. If you see a roof in your travels that you are interested in, take a photo of the roof and show it to someone at a roofing supply company who can help you identify the roof covering material. Try and get a closer picture of the roof showing some of the details of the roof covering if you can. 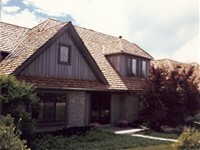 Below are links to the three most widely used Steep-Sloped roofing materials. Here you will find information about what they are made of and the various types, styles and textures they are available in. You will also get a better idea of their true life expectancy, their advantages and disadvantages without the hype from the manufacturers or salesmen, plus a lot more.